1) From termini to Colosseum take Omnia Hop on Hop Off (The yellow bus). We went around Colosseum for 1.5hours, Palatine hill and Roman Forum for 2 hours. 1) Colosseum, also known as Flavian Amphitheatre was built mostly with travertino (limestones), and cement. Despite its completion in 80 A.D., Colosseum has undergo several modification during the reign of Domitian (81–96 A.D.), reconstruction due to earthquate (14th century), and even in 21st century to sustain the Roman architecture. Between 80 A.D. to 523 A.D. the Colosseum was primarily built for the Roman’s ‘entertainment’ where the spectators witnessed brutal combat between wild beasts to beast/ beast to human (gladiators- slaves captured during the war) / human to human for free over the course of 100 days. Despite the gladiators’ fights were over by the year 438 A.D., wild beast hunt still went on until 523 A.D. 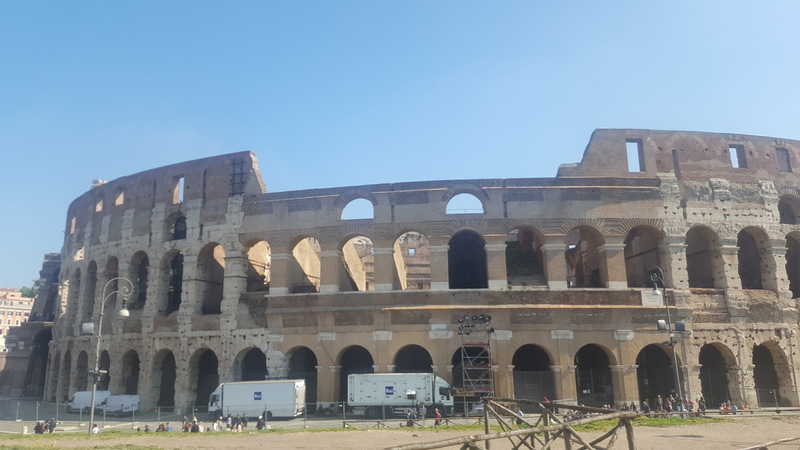 It was also used as a site for drama and reenactment of battles classical mythology, until its later use as Christian Shrine (Roman Catholic Church), as each Good Friday the Pope leads a touchlit “Way of the Cross” procession that starts in the area around the Colosseum. It is also now known as the largest tourist attraction in Rome sure not to miss. 2) Palatine Hill, only a short walk from Colosseum, is the most ancient part of the city that stands 40m above the Roman Forum. Despite both attractions being overshadowed by their neighbouring ancient building (Colosseum), the view of other Roman remains such as Circus Maximus, palaces, and cathedrals. We can confidently say (after several good reads of Rome travel guidebooks) that Palatine Hill is the centre where ‘Rome’ has started having human settlement, with the Ancient Romans believing that Romulus; first king of Rome and his twin brother Remus lived in the cave of this very hill. Romulus then commemorated the finding of city during the festival of Parilia, in which he made sacrifices to gods, established the Roman senate, and granted (introduced) citizenship. 3) The Roman Forum surrounded by the ruins of several important ancient government buildings at the center of the city of Rome. Citizens of the ancient city referred to this space, originally a marketplace, as the Forum Magnum, or simply the Forum. For centuries the center of Roman public life: the site of triumphal processions and elections; the venue for public speeches, criminal trials, and gladiatorial matches; and the nucleus of commercial affairs. Here statues and monuments commemorated the city’s great men. The teeming heart of ancient Rome, it has been called the most celebrated meeting place in the world, and in all history. Located in the small valley between the Palatineand Capitoline Hills or the Palatine Hill, the Forum today is a sprawling ruin of architectural fragments and intermittent archaeological excavations attracting many sight-seers.